Old Fangs - voice record. Kila Records release soundtrack in Eire! "Funny in the Q&A after the film yesterday I was saying something about the art direction & the translator said 'Rod Stewart' and everybody oohed &aaahed"
But check out the photo Nora sent above! 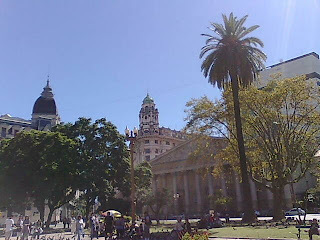 That's Plaza de Mayo ;-) You can see the BsAs Cathedral from there. I was there during the screening, and I have to admit that the girl who translated what you said was dreadful. I would also like to say that I simply couldn`t believe how beautiful this film was. It`s amazing how you captured the medieval style and Gustav Klimt`s art all in one film. I came home and told my family they simply had to see it, somewhere, sometime. I am a great fan of Irish films, so I had tickets for every single Irish film screened at the BAFICI festival, and yours was, by far, my favourite one. Congratulations on what you`ve achieved, thank you for the impossibly beautiful film, and good luck.